While most of the general population has been lulled into a false sense of security, bankers and tech executives are spending millions upon millions of dollars to prepare for the collapse of society. Do they know something that the rest of us do not? 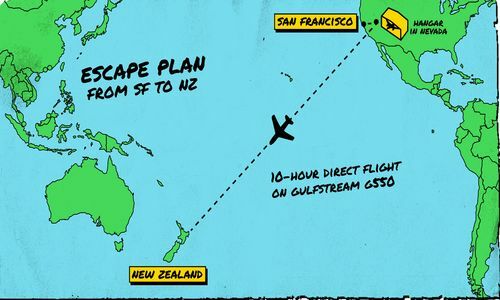 Apparently talk of doomsday scenarios has become very popular at Silicon Valley dinner parties, and as you will see below, having a plan to escape to New Zealand appears to be a very popular "Plan B" among the tech elite. Of course this is not just a west coast phenomenon. Many bankers on the east coast have similar concerns and have also been developing contingency plans. Ladies and gentlemen, they know what is coming and they are feverishly getting prepared for it. That's how J.P. Morgan Chase's head quant, Marko Kolanovic, envisions the next financial crisis. The forces that have transformed markets in the last decade, namely the rise of computerized trading and passive investing, are setting up conditions for potentially violent moves once the current bull market ends, according to a report from Kolanovic sent to the bank's clients on Tuesday. His note is part of a 168-page mega-report, written for the 10th anniversary of the 2008 financial crisis, with perspectives from 48 of the bank's analysts and economists. Kolanovic closes his report on an ominous note: "The next crisis is also likely to result in social tensions similar to those witnessed 50 years ago in 1968." In recent months, two 150-ton survival bunkers journeyed by land and sea from a Texas warehouse to the shores of New Zealand, where they're buried 11 feet underground. Seven Silicon Valley entrepreneurs have purchased bunkers from Rising S Co. and planted them in New Zealand in the past two years, said Gary Lynch, the manufacturer's general manager. At the first sign of an apocalypse -- nuclear war, a killer germ, a French Revolution-style uprising targeting the 1 percent -- the Californians plan to hop on a private jet and hunker down, he said. Well, it is because New Zealand doesn't have any enemies, English is spoken there, it is very stable, and it is very far away from everything else. Billionaire hedge-fund honcho Julian Robertson owns a lodge overlooking Lake Wakatipu in Queenstown, the South Island's luxury resort destination. Fidelity National Financial Inc. Chairman Bill Foley has a homestead in the Wairarapa region, north of Wellington, and Titanic director James Cameron bought a mansion nearby at Lake Pounui. Of course not everyone plans to leave. Luxury survival bunkers are also being constructed all over the heartland of America, but they aren't cheap. It was designed to withstand a nuclear blast or nature's worst, but is far cry from what you might expect an underground shelter to look like. Last year, it was reported that plush 3,600sq ft penthouses within the shelter - a former missile silo - were selling for $4.5m. Unfortunately, the rest of us don't have the money to buy a luxury survival bunker or to fly to New Zealand on a private jet. Money may not be able to buy happiness, but it can buy a pretty good escape plan.